While fabled Chicago wing institutions like Crisp regularly turn up next to the likes of Jake Melnick’s Corner Tap on lists like this one, and this one, and even this one, Chicago is a proud city of significant wing diversity. So, in the interest of celebrating that diversity, we put together this list of Chicago's best under-the-radar chicken wings, all of which aren't on any of the "best of" lists from Chicagoist, ChicagoTraveler, or Thrillist (that's us!). A number of places smoke wings (err day) before crisping them up in the fryer, but this upscale take on Carolina low country cuisine is still the best we’ve had, with plump and juicy wings that retain the flavor of the smokehouse even after being fried and coated in a sweet glaze. The "Little Hotties" chicken creations at this Pilsen joint will steal your heart and leave you wanting more. The daughter of the owners of Great Sea on Lawrence (also known for its wings), opened up her own place here a few years back, much to the delight of locals. Served lollipop-style and resulting in skin that's crispy while your hands stay clean, the wings come in different levels of heat with a sweet after-note. One of Chicago's original Diners, Drive-Ins and Dives, Hienie’s has been feeding a cult following ever since being featured on the cover of the original The Streets and San Man's Guide to Chicago Eats. Located on the Southeast Side, Hienie's doubles as both a fried shrimp shack and fried chicken shack -- get the bright orange sauce, a radioactive-looking sauce that’s so beloved (AND ADDICTIVE), it once hosted its own Facebook page. 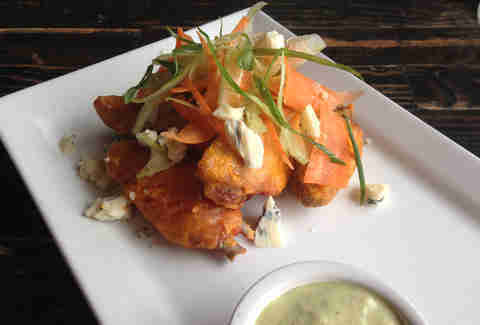 There’s no posher drink-and-wings combo in town than following a night at the Aviary with a plate of wings across the street at this South American-inspired hotspot, which puts a Brazilian spin on Buffalo wings with a fiery piri-piri sauce coating and a big bowl of cooling blue cheese dip. Hot dogs, burgers, and other Chicago-style favorites are served at this family-run spot (which has been a favorite of the people in the Lincoln Square and Ravenswood 'hoods since 1980), but the no-brainer, go-to order here is the chicken wings. 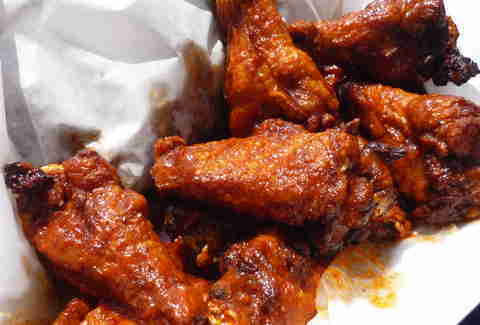 Owned by the same family behind Crisp, Budacki's does wings a little differently: perfectly fried and doused in a marinade that mixes Asian spice with Buffalo sauce resulting in a tantalizing flavor combination. 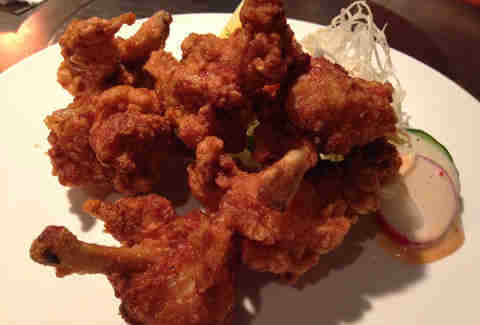 "Karaage!" That's Japanese for an especially delicate form of flash frying. And although this is a Korean barbecue restaurant, it's staffed with Japanese owners and terrific Japanese fried chicken wings. Ever smell sweet smoke in the air while riding down Chicago Ave in Ukrainian Village? Odds are it was coming from this popular Jamaican lounge, where chicken is smoked and grilled in back and never fails to please. Should you want to further explore the menu while still getting your jerk chicken fix, we suggest the grilled wings appetizer (fried works, too). They’re perfectly smoked with hints of allspice and just enough Scotch Bonnet pepper to have you break a sweat before you cool down with an ice-cold Ting. 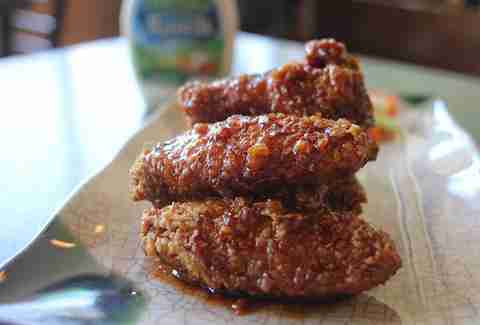 This sunny, casual Korean spot in a Kedzie strip mall does wings with a crunchy skin, sort of like those ‘60s recipes for fried chicken with corn flake batter coated in a gooey, sticky-sweet Asian glaze. The texture is tops and it’s endearing to know that the staff doesn’t even pretend to make its own ranch dressing. Your order proudly comes with a bottle straight from Jewel. 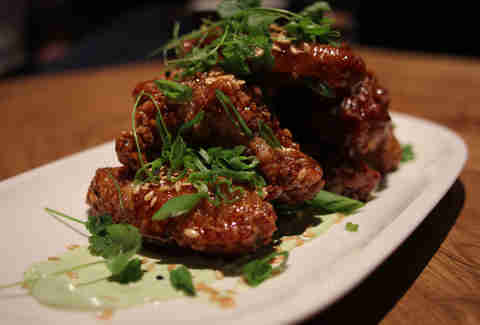 A bright little Korean fast-food spot tucked away on Granville, it has two flavors of wings. But unless you have to have the heat, go for the soy-ginger, in which big crispy wings gain a lot from the multidimensional glaze they’re soaked in. 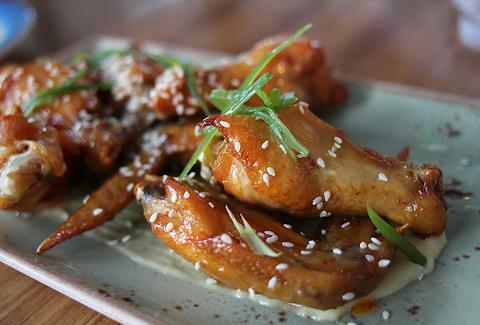 The place that took over the old Graham Elliot location specializes in upscale comfort food, so a snazzy plate of wings is a natural choice. Chef Joseph Heppe smokes them first, then fries and glazes them in a spicy, Asian-style sauce. The real breakthrough on the plate, though? The light, cooling cilantro-yogurt dipping sauce. These guys get the award for most ridiculous amount of original sauces offered. To help you better select your flavor, options are broken down by country and given a heat rating. Popular sauces include cheesy Buffalo, jerk, and garlic Parmesan, which comes laced with bits of potent garlic up and down each piece. Do 'em grilled or fried (or both!). While this longtime Howard St favorite does offer a really nice rendition of classically fried chicken wings, here it's all about the signature offering, the "Oriental Chicken." Split wings are doused in a sweet citrus sauce with Korean flair, served in orders of eight to 100 (yes, 100), along with white rice that's heavily infused with the sauce. Fast food wings don't get much better. 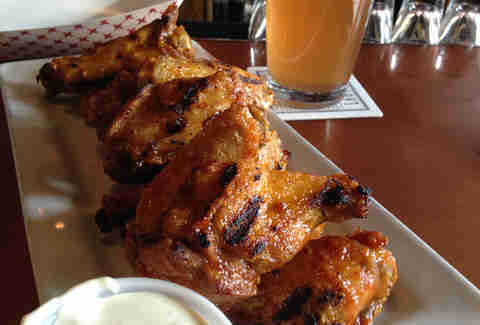 Providing wings and a good beer list is job number one for lots of neighborhood bars. Okay. All neighborhood bars. But this Ukie Village tavern takes things one step further by not only doing classic Buffalo wings awfully well, but pushing the boundaries in the process. 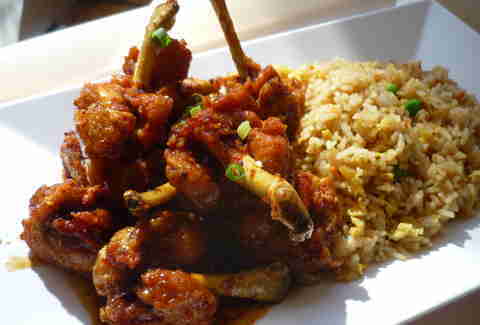 The recently introduced Asian wings feature a nice backyard-grill char under a not-too-sticky glaze.